Who knows anymore...not to steer you away but they didn't have any clearance Lego after X-mas last year. Walmarts calendar year ends on Feb. 1rst. So that's when they do inventory and move stuff around on shelves. Well, if I head out I will certainly post the news for eveyone.....and yes, I know I am MAD to even think it! I know a store where you can get a Goblin King Battle for $75.00. Been sitting there since Aug.
Im at a fairly well stocked store and the older ninjago sets arent discounted more than 20%. Manager seemed like he was used to hearing questions about Lego clearance and had his prepared statement about "possibly at the end of January." Lego store's got nothing from what I saw online, on to Target. I didn't find anything at Wal-Mart either. Looks like it's going to be the same as it was last year. Y'all are masochists for attempting this! Thanks for the reports of nada. Think how much gas you have saved your fellow bricksetters with the price at $2.24 a gallon at our Cary NC Kroger grocery store station. Now, go back to bed or at least build some LEGO and have a little fun today! Lickily, only three miles roundtrip! There is gas in Cary, NC??? We got off the highway there once and found that they must have banned gas stations and signs of any kind. Finally had to use our phones to find a run down station three miles away! Check your Sam's Clubs! Picked up a (very damaged box) copy of the Riddler Dragster Chase for $16.91. Found a few bargins at Walmart. Most notably #60052 (Blue Train set) for $139.00 and #75052 (SW Cantina) for $49.00. Go dog, go!! Just picked up a ISD for $74 and a AT-AT for $64 in Canada. The clearance price for 79010: The Goblin King Battle is still $79. I found a couple of #6869 (Quinjet Aerial Battle) for $49, must have been stored in the back for a long time. Also saw #6873 Spider-Man/Doc Ock for $21. ^A local Walmart here had a whole bunch of Quinjets at that price. Every box was badly damaged and horribly taped up. Methinks minifigures were missing in all of them. Yet, no question returns at Walmart it seems. No clearance really around me either. I miss a few years ago before LEGO was hugely popular...stupid LEGO movie. I miss a few years ago before LEGO was hugely popular...stupid LEGO movie. I feel that way too. Lego is too popular now, I don't like it. ...ever show up late to a party feel resented that you are there? 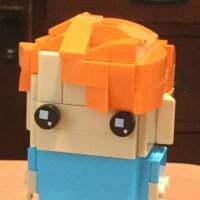 Those of us back into Legos (after 20 years in my case) because of the LEGO Movie are feeling a bit of a chill around here lately. I'm happy it is popular cause kids playing with LEGO is always a good thing. I feel I have been able to pick up more deals these days because the information relevant to LEGO deals is propagated so well on the internet fan sites. You do have to work faster/harder to get the deals when they are available. I live in a large city with multiple LEGO resellers and still manage to get most of the deals I want. As for this thread, I'm still cool on Wal*Mart's lack of summer clearance. I was watching some Goblin King, Pirate Ship Ambush, and Laketown Chase sets waiting for them to drop below 25% off. I watched for at least 1, if not 2 months waiting for any drop. Unfortunately I never saw them go lower until the Clearance section was put away for Xmas. After hitting 9 Walmart’s in the past 2 days, I'd have to say that is year’s sales was much better than last year. First, most stores had their stuff clearly mark the day after Christmas with red tags. This wasn't the case last year when each store put stuff on sale on their own schedule. I didn’t have to do much scanner surfing. Second, they had a LOT of stuff on sale compared to the past two years. All major themes (except Superhero’s) had sets marked down. While I didn’t find anything at 50% off like back in "the good-ol'-days", 25-33% was the norm. And that was on good sets like the AT-AT, The Cantina, and Emmet's Construct-o-mech. So I was pleased with this years haul. As is common with rooting through the shelves at Walmart, I found a few old sets like a perfect LR Stagecoach. One thing that wasn’t different is that the Lego aisle in about 1/2 the stores, especially the ones in the big city, were absolutely destroyed: sets everywhere, sets opened and random stuff tossed on the shelves by lazy customers. For future reference, Highway 70 just off 40 south of downtown also has pretty cheap gas. $2.21 today. My opinion has nothing to do with getting deals. I just don't like things that are trendy or wildly popular. Picked up Benny's Spaceship - $59 and Witch King Battle - $8 today at Walmart, Canada. Very pleased. Checked one local WM only really a cargo train 139.99 left. This is my Walmart Lego section... I don't think they did any clearance ...lol. ^ Sweet Fancy Moses! This was a bad year for post-Christmas leftovers, but that is crazy. Oh and technic pull back racers and ski thingy. Not sure what that is called! Still few clearance sets at WM or Target or TRU around here. I did find the Dareth Ninjago pollywog (Love it when computer changes polyBAG to polyWOG every time!) and all the new Friends sets at TRU today, and they seemed to be at list prices. Wow! But there is no promo this week, so unless you really need something ASAP, it may be best to wait until they have a freebie with your purchase. It looks like there is less than half of an aisle only on one side for LEGO at our Cary Super WM now; that is the least LEGO space I have ever seen. And now WM and our Super Target are placing Megab... right in the LEGO area, which really pisses me off. The last thing I want to look at in the middle of the tiny LEGO display is several of the competitors' sets. I am crosseyed from spending the last three days sorting gray bricks...old dark, new dark, old light, new BLEY. If they introduce another shade of gray, I am going to go ballistic and start assaulting LEGO employees with gray bricks fired from a cannon. Had to buy a better all natural light standing lamp and open the blinds to see the difference. Holy cow this is tough! Seriously thinking of selling off my tons of old dark and old light gray even though they came in so many of our old sets, which have long been parted out. Wal-Mart pretty much never comes through for me when it comes to sales or clearance, but yesterday one Wal-Mart had 3 Avengers Quinjet on clearance, $50.00 each down from $70.00. I picked one up as it's discontinued. Just visited my local Wal-Mart to pick up my 2 RI that I had shipped to the store. Walked thru the Lego aisle and it was totally cleaned out. There were only a few SW Cantinas and some Ninjago/Chima sets. All of the clearance items were gone. My local Walmart (Lakeville, MN) didn't have much on clearance, but they did have An Unexpected Gathering for $49...picked up a spare copy to have NIB. I went to another local WM here today, and I didn't see much of anything. There are two or three more around here worth checking out, but I haven't gotten to them yet. Hopefully soon, and hopefully they'll have something on clearance. Just to show YMMV, found #75054 at the Humboldt TN WM for $74. Excellent price for the number of pieces. Other than that, nothing but a few Chima and other odds and ends. Was able to find #70010 Chima Lions Den for $74 and Chima Flying Phoenix #60146....this WM still has the same 3 LOTR Pirate Ambush for $74 since this summer. Not excited about any Chima stuff...but #70010 sold real well before X-mas. ^ I'll trade you those Pirate sets for the Goblin King Battles that have been collecting flys at my Walmart! Does anyone know if walmarts had some sort of major unmarked clearance this year or something? 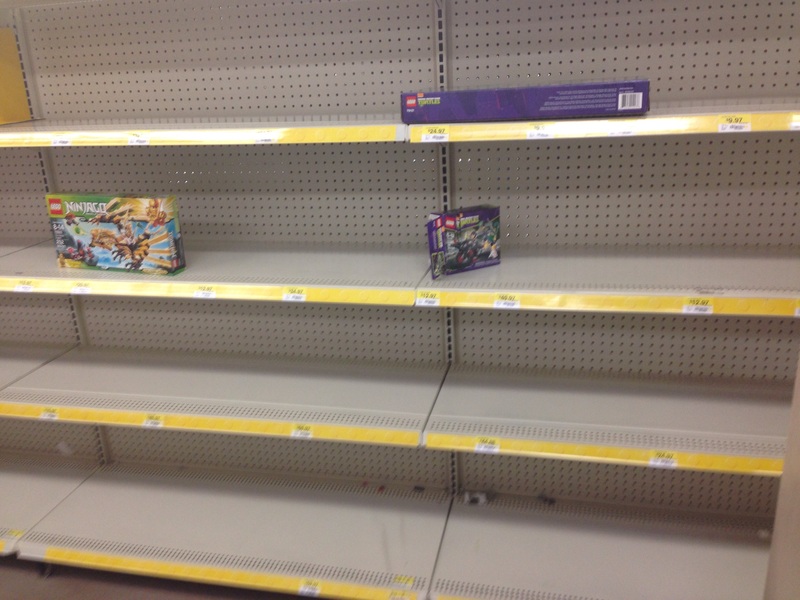 Went into Walmart last night to check for a few things and i discovered that the lego section was at least 80% bare! Lego is something that's not known to move fast at this Walmart so seeing it this bare is really weird! Fun part is to see when/if WM will get off its rump to get the aisle reset properly. There were a bunch of things on 10-30% off at the one I just went to. Hero Factory, some City, a couple of Lego Movie, Duplo... No Star Wars, Marvel, LOTR/Hobbit or anything. Some of what was left had beat-up boxes. Some of the discounted sets had stickers, others just rang up on sale. Mine has been stocking old Monster a Fighters, Sponge Bob, and Ben 10 sets I've never seen on their shelves and they're all at least 40% off. I'm jealous of everyone saying their finding LOTR/Hobbit sets on clearance. I haven't even seen them at my local Walmarts. Too many Chima sets!